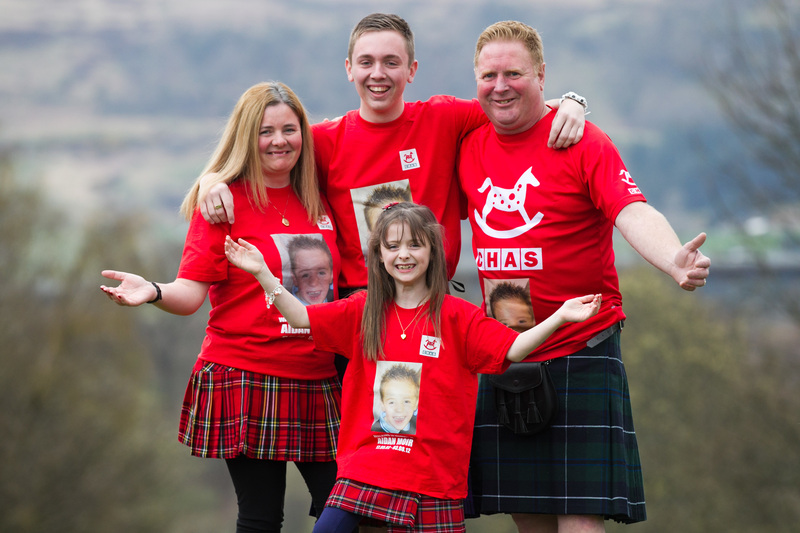 Along with husband Paul, son Connor, 17, and daughter Rebekah, 8 – as well as a mighty gang of pals – she’s taking part in the Glasgow Kiltwalk to raise funds for the hospice that gave her son Aidan so much. The family first came into contact with Robin House after Aidan was diagnosed with late infantile Batten’s disease in 2007 at the age of five. At first Claire and Paul, from Erskine, were reluctant to take their little boy to a hospice, but after he became seriously ill in 2008 they were convinced to give it a try. “I suppose we were too scared to go,” explains Claire. “We didn’t know what to expect. “But in that first year Aidan lost everything – his eyesight, his ability to walk, talk and eat. In common with many parents who go to Robin House, their preconceptions were to be proved very wrong. “From the minute we walked through the door it was nothing like we expected,” recalls Claire. “It was so bright and all the staff were so friendly. It was as if there had been a huge weight lifted off our shoulders. Against all expectations, Aidan pulled through, and his grateful family had four more precious years with him. During that time Robin House was a rock for them. “We were back and forward, and must have been told six times ‘This is it’,” says Claire. “But he battled back every time. In 2012, Aidan’s health started to deteriorate. Claire and Paul managed to get him to Robin House, where he passed away on a Friday night, aged just 10. “Robin House were with us every step of the way,” says Claire. And they still are. It’s no surprise that Aidan’s family are incredibly motivated when it comes to raising funds to support Robin House. For the past five years they’ve been taking part in Kiltwalk – and roping in as many of their friends and family as possible. This year there will be 34 of the gang taking part, and there’s healthy competition to see who can finish first – especially between Paul and Connor. And of course, one person is with them every step of the way, in their hearts and minds. “We have Team Aidan t-shirts,” says Claire. “So you always see that cheeky wee smile. IF you’re inspired to walk for Robin House, we’ve just been given a batch of special last-minute FREE places available for the Glasgow Kiltwalk. CHAS has pre-purchased 75 slots for the event, which takes place this Sunday – April 24. If you want to take part to raise money for Oor Hoose, you can use one of their free entry codes. Simply go to the registration page at www.thekiltwalk.co.uk select the Glasgow event and pick your walk – you can choose 26 miles, 14 miles or a Wee Wander at just six miles. Then enter the PIN code – CHAS2016 – in the registration form. Please register as soon as possible as the code expires at 9am on Wednesday April 20.